Two men slammed the butts of their rifles against the car windows. Their bodies glowed with anger. The glass cracked, fractures spreading. Michael and I pulled apart, waited tensely, and then the windshield broke, the sound loud and echoing. We covered our faces as shards of glass shattered around us, refracting sharp prisms of light. Michael and I reached for Christophe at the same time. The baby was still smiling but his lips quivered, his eyes wide. My hands could not quite reach him. My child was so close my fingers thrummed. If I touched my child, we would all be fine; this terrible thing would not happen. A man reached into the window and unlocked my door. He started to pull me out of the car roughly, growling as the seat belt held me inside. After he slapped my face, he ordered me to unlock my seat belt. My hands shook as I depressed the button. I was lifted up and out of our car and thrown into the street. The skin covering my face stung. My body deflated. My body was just skin stretched too tightly over bone, nothing more, no air. The man sneered at me, called me diaspora with the resentment those Haitians who cannot leave hold for those of us who can. His skin was slick. I couldn’t hold on to him. I tried to scratch, but my fingers only collected a thick layer of sweat. I tried to grab on to the car door. He slammed his gun against my fingers. I yelled, “My baby. Don’t hurt my baby.” One of the men grabbed me by my hair and threw me to the ground, kicked me in my stomach. I gasped as I wrapped my arms around myself. A small crowd gathered. I begged them to help. They did not. They stood and watched me screaming and fighting with all the muscles in my heart. I saw their faces and the indifference in their eyes, the relief that it was not yet their time; the wolves had not yet come for them. Mireille is been kidnapped, held for a million dollar ransom. However, her father does not want to pay. Supposedly, he feels that giving in to the ransom demands too easily will only result in his wife and other children being targets. In truth, he has fought too hard throughout his life for what he has to be able to give it up to those who didn’t earn it. This is An Untamed State, the new novel by Roxane Gay. As most are already aware, Roxane Gay is author of Ayiti and the forthcoming book of essays Bad Feminist as well as co-editor of PANK. As is already evident from the above, there is a great deal of horrifying brutality in An Untamed State. There has to be. Mireille does not shield the reader from it, even when has to retreat from herself into being no one in order to survive, much less relate what happens. However, the book is not just a suspense thriller. There is also a great deal of wonderfully beautiful in An Untamed State, such as remembrances about how Mireille overcame what she’d been taught by life in order to be close to her husband and child. The horror and beauty are interspersed, intriguingly so. As I read I found myself wondering if the beautiful moments increased the tension because I knew more horror was right around the corner. Or, did those moments increase the tension by letting up on the terror just long enough that I felt it afresh when it returned? Or, did they make me even more horrified at whom it was all happening to? I’m not sure; perhaps all of these things were going on. All I know for certain is An Untamed State was moving me with a great deal of force. Frankly, the beauty and horror aren’t even that easily separated in An Untamed State. There are many places where there is a mix. In certain moments, I found it sometimes hard to tell which was predominant. Perhaps that isn’t something that is possible to discern or classify in moments like that. Those mixture times were some of the hardest moments to read, though also some of the most gratifying. An Untamed State is not an easy book, though there is nothing about the prose that is difficult. In fact, it’s hard to stop reading. This book is powerful enough, both in its horror and its beauty, that it leaves the reader emotionally raw afterward. 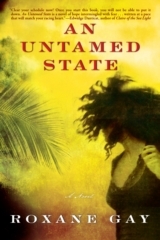 Read An Untamed State and see for yourself. David S. Atkinson is the author of Bones Buried in the Dirt and The Garden of Good and Evil Pancakes (EAB Publishing, spring 2014). His writing appears in Bartleby Snopes, Grey Sparrow Journal, Interrobang?! Magazine, Atticus Review, and others. His writing website is http://davidsatkinsonwriting.com/ and he spends his non-literary time working as a patent attorney in Denver. This entry was posted in Book Reviews and tagged An Untamed State, Book Review, David S. Atkinson, Grove Atlantic Press, Roxane Gay, Sundog Lit, Sundog Lit Blog. Bookmark the permalink.